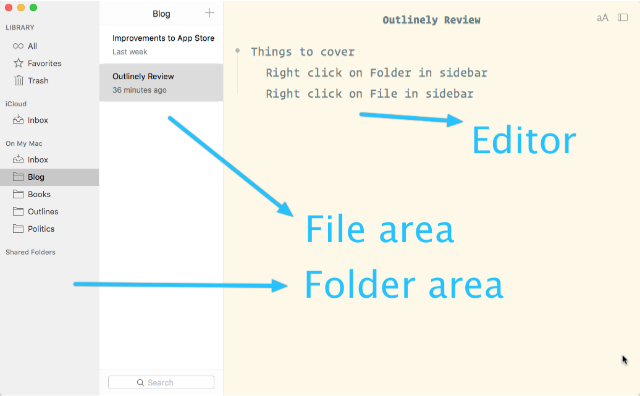 Outlinely is a text editor with the heart of an outline. Or, if you prefer, it is an outliner with the heart of a text editor. It lets you write content in markdown, while using the metaphor of an outliner as its organizing engine. The seamless merger of a text editor and an outliner is the goal of this program. I wrote about Outlinely previously here. Outlinely has been updated to version 2.0 and it has grown a younger sibling, Outlinely Express. I am going to cover the new features of Outlinely and then touch on Outlinely Express later in the piece. 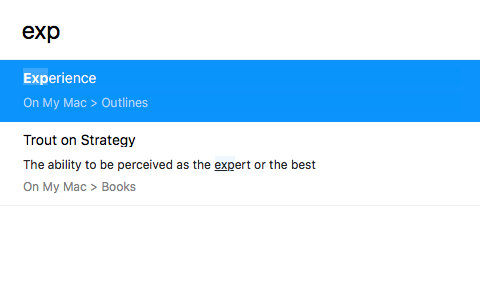 Library: Outlinely now gives you the ability to organize your outlines in folders and to achieve this it introduces the concept of a Library. It is the usual three pane Library UI. Outlinely has iCloud support. The developer hasn't announced anything, but this leads me to speculate that their might be an iOS version in the future. That would make this product perfect. At this point, you can have your files stored in iCloud or on your Mac. The Library has sections for both. Right-Clicking on a folder in the Folder sidebar gives you the following drop-down menu. Useful commands. The Show in Finder command opens up a finder window with the contents of the folder. This is useful if you are even vaguely interested in knowing where your files are in this new Library. Right clicking on a File gives you a similar drop-down menu. Usual commands, but the one which is interesting is the Add to Favorites option. You can add a file to the Favorites and it shows up in the Favorites group in the Folder sidebar. Makes it easier to access the outline you are working on currently. The Library is enhanced with an Open Quickly (⇧+⌘+O) command. It searches through your library across folders for files. It comes up with matches both for the title and the contents of the files. This is an useful addition to the program specially if you have a ton of outlines. Preferences: Outlinely in its newest version has grown a preferences panel with some nice additions. It gives you the option of specifying line height and paragraph spacing. You can condense or expand the way text is rendered on the editor window. That gives you the ability to fit more content into a view or choose to display your content in a manner you are comfortable with. Useful if you are writing a long outline, and there is a lot of material on the editor trying to attract your attention. Which brings me to the next feature. Focus Mode: When you are writing and the outline is rather long, you will find that it helps to be in Focus Mode. Focus Mode dims out all the content except the current section of text you are working on. 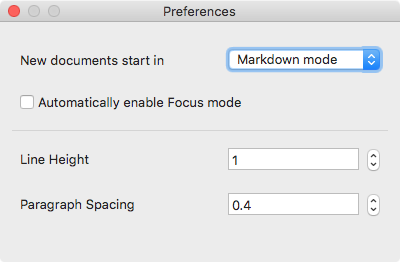 This is similar to the Focus Mode shared by programs like iA Writer and Byword. I have wanted this in an outliner and am happy to see its appearance in Outlinely. Full Screen Mode: Outlinely is beautiful in full-screen mode. 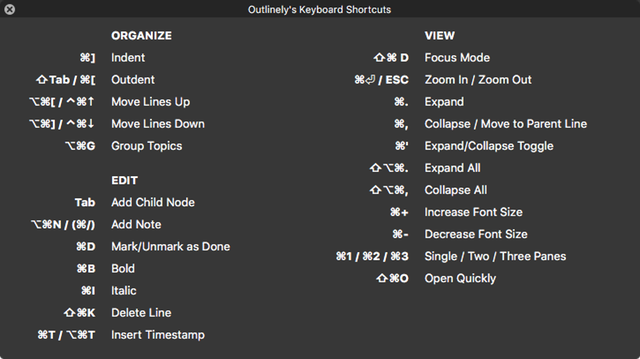 Keyboard commands: Outlinely has always supported a selection of useful keyboard commands. The extensive support for keyboard commands makes the process of using this program pleasurable. I like the focus on keyboard commands and on the program giving you easy access to the main ones in its help menu. 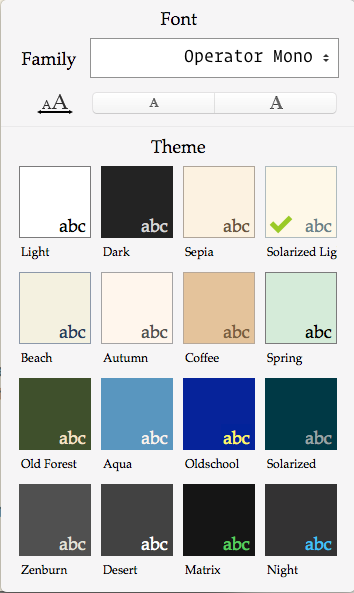 Themes and Font Choice: When you click on the icon depicted by an A on the top-right of the editor window you get a drop down menu. You get a choice of themes and you get to assign a font to work in. Complete manual: The developer provides a complete manual on the program online. It is easy to follow, and a significant help to the use of the program. I wish more developers did this. Typewriter Mode. I like focus mode but the product would be improved with support for a typewriter mode. If you expect me to write on a screen, you have to give me the ability to stare at the middle of the screen and not at the bottom of the screen. It is a pain to be always looking at the bottom of the screen. Please include a typewriter mode. That would enhance focus mode. Font Face Support: I want to be able to choose a particular font face and not a font. Operator Mono for instance has a light version I am particularly fond of. I can't pick that. It has an italic and bold version. The rendering should be fine, but the program defaults to the Regular. I wish I had more control over this. iOS Version: From your support of iCloud, I am getting the feeling that you are moving towards an iOS version. Please let me be right. An iOS version will make this product versatile. This is Outlinely 2.0 without the Library. It is free. It is a great way to test out the product and decide whether you want to upgrade to the whole version. I think you are going to love it. Outlinely and Outlinely Express are recommended heartily.